Home >> Categories >> Chinese Washstands >> Modern Chinese CD cabinet with attractive bamboo design LE-205 . Modern Chinese CD cabinet with attractive bamboo design LE-205 . 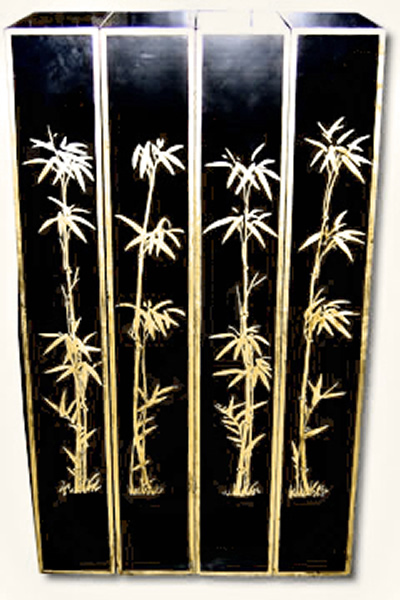 This beautiful modern Chinese CD cabinet is dramatic with balck and gold lacquering and stunning in its style and simplicity. It can be opened out to form a screen or room divider or can be closed to form a small neat practical home for your music and film collections. There are four sections, each with six shelves creating space for the most extensive array of CDs. It is on sturdy wheels which make it easy to move and control.